WOW, when I left, Turk Lachmaj’un I was impressed. 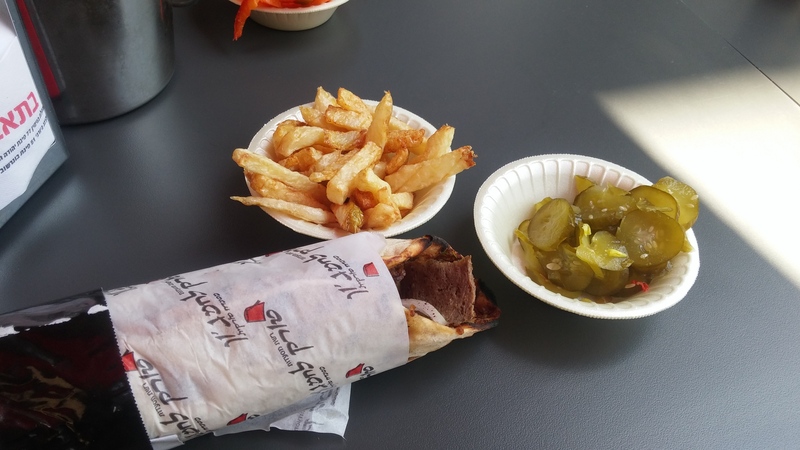 I mean it’s known that the two most common street foods in Israel are falafel and shwarma, but the way they do things at Turk Lachmaj’un really take it to the next level. I want to thank my friend Mitch Schnieder for introducing me to this place because I KNOW I’m going to head back there. 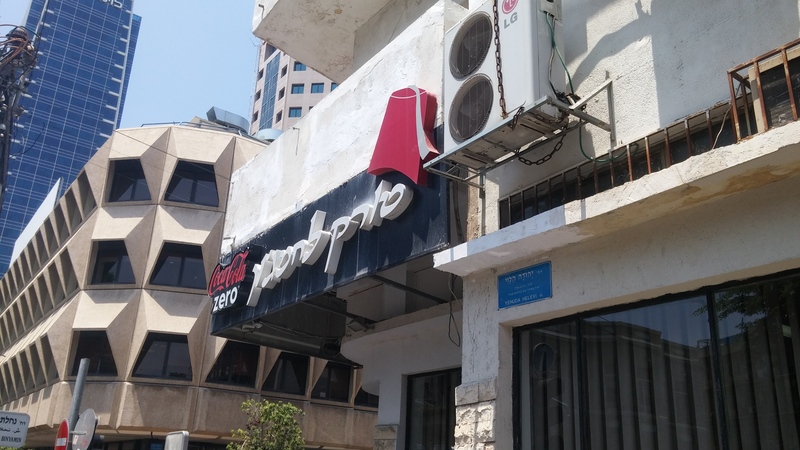 Turk Lachmaj’un (Kosher Rabbanute Tel Aviv) has been around for a while, and their standards have stayed the same since day 1. For those of you who don’t know what a lachmaj’un is, (here comes the culinary tidbit) it’s a loaf of bread baked with any type of meat inside. The dish hails from Turkey, and has become a very popular dish in restaurants around Israel. Traditionally it’s baked with lamb, but those who can’t afford it will use beef or any other meat they fancy. Traditionally it’s served with techina, but you can enjoy it with any dip you like. Now to the restaurant. I call it a restaurant because it really is. 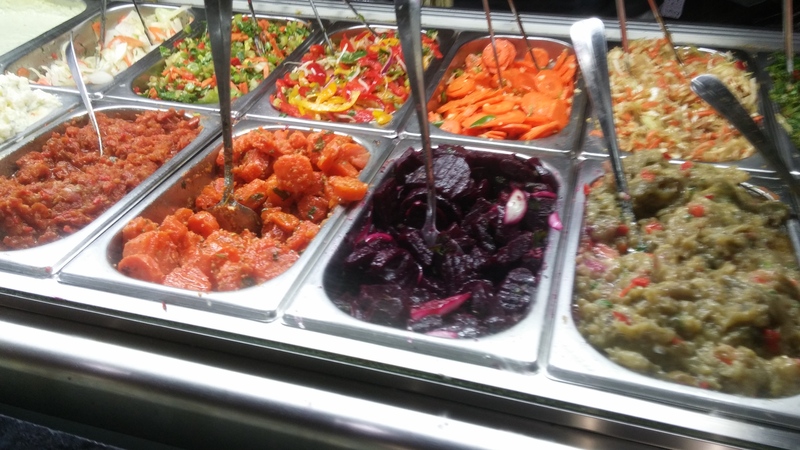 You have an option to either eat a shwarma to go and have them wrap up your meal in a laffa or lachmaj’un or to sit down and enjoy the full experience where they bring you salads to your table and you eat with a fork and knife. I chose the first option, and it was perfect! A little more about the restaurant, show up early or you will be waiting a long time to enjoy an amazing meal because the place is packed during the lunch rush. 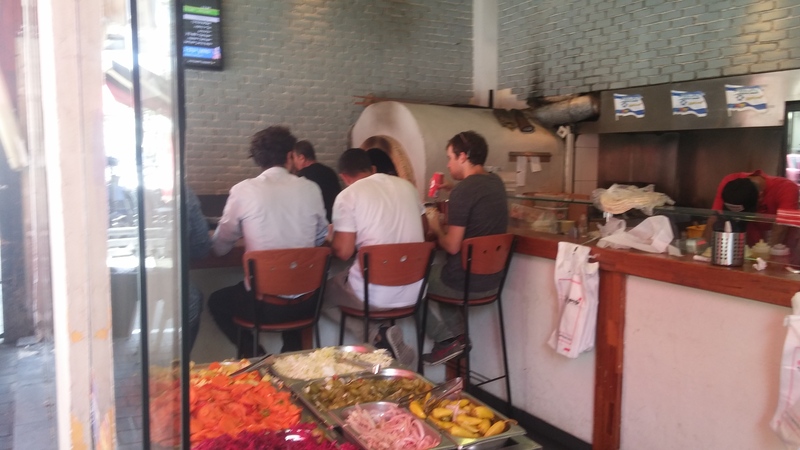 Most of the food is made in-house from the salads to the fries, I don’t know if the meat is prepared there but I know that each lachmaj’un is made in the stone oven that they hide in the corner. Now I need to break down the lacmaj’un process for you: They bake each lachmaj’un fresh to order. the lachmaj’un is prepared like this: they bake the meat and spices into and open-faced type of laffa bread and then when it comes out of the oven, they fill it with more meat!If you aren’t already drooling, here comes the fun part, I chose lamb all the way through, then he put in the fillings that were so fresh, from the techina dripping through, pickled onions, and I don’t even remember what else the guy put in, but it made it a perfect bite! The lamb was super moist and full of flavor and you can taste the lamb all the way through because it’s baked into the bread! The fries were a bit soggy because sadly Israelis don’t believe in a double fry french fry (pomme frites) but everything else was just perfect. 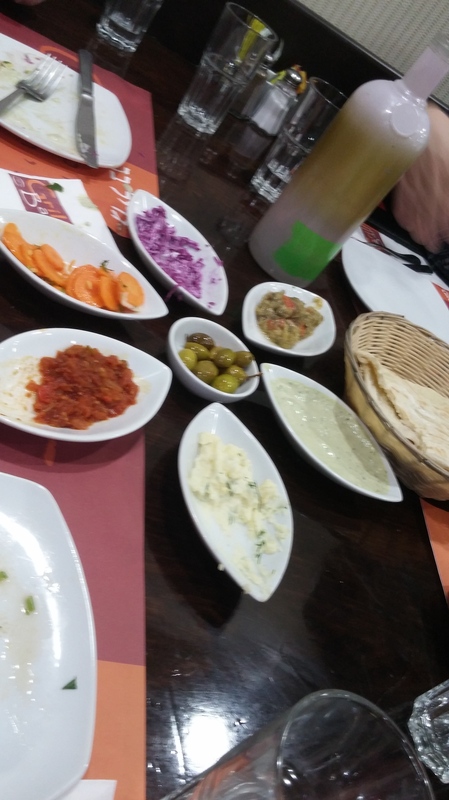 Turk Lachmaj’un is one of the best shwarmas I have had in Israel, definitely in my top 5 in Israel. 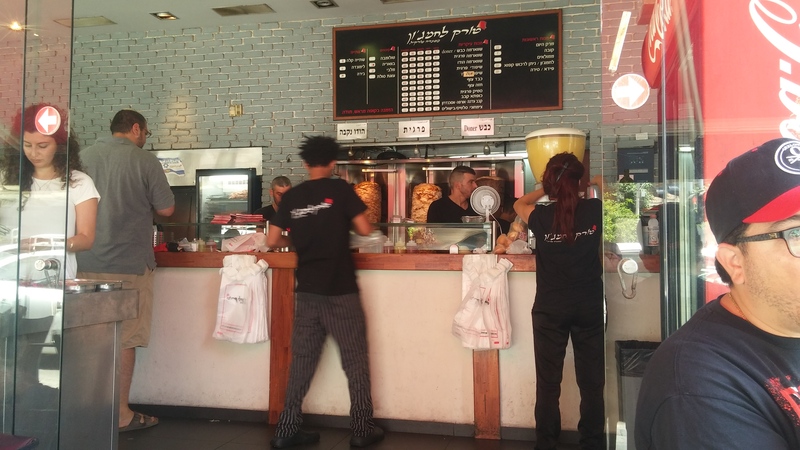 So if you find yourself in the Nachalat Binyamin area of central Tel Aviv, come by foot, because there’s almost no parking and get on line for some of the best shwarma, Tel Aviv has to offer. Getting ready for the pesach holiday is every parents nightmare, but we took a break for a couple of minutes as a family to throw a surprise birthday party for my father at the Grill Bar. 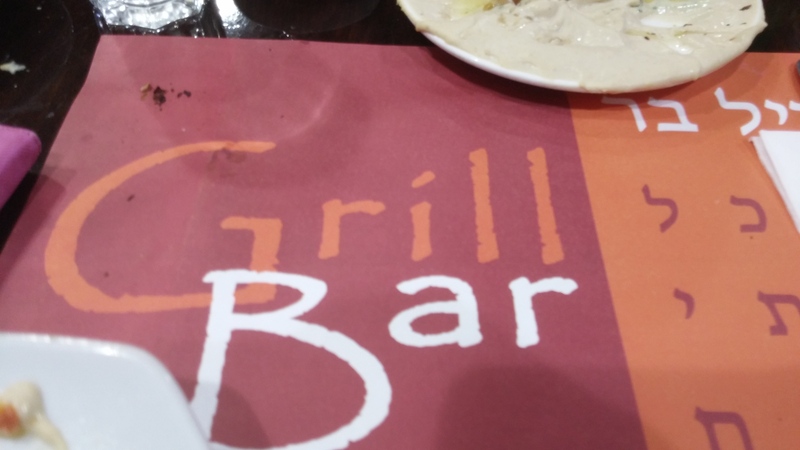 Why the Grill Bar and not somewhere fancier? Because you really get your value for your money. We where 13 people and paid less than a 1000 shekel in all. They also have a private room that seats 30 in the back as well. The Kashrut is Rav Machpud(there is a big lighted sign next to the door, a new trend in the kosher world) so it fit everyone’s needs. So about the steakiyah(a steakiyah is an Israeli steakhouse that serves a lot of salads, fresh pita bread and grilled skewered meats), the decor is simplistic but inviting, wooden chairs so you don’t stay that long and has an open kitchen, which I personally like the concept. The service was on point and fast. They use Ipads to take your orders and not just scribbled on a piece of paper which is faster, cost efficient and just plain and simple smart. One of my favorites things there was watching a server that during the entire service was refilling the salad plates, non stop, like a machine, very entertaining. 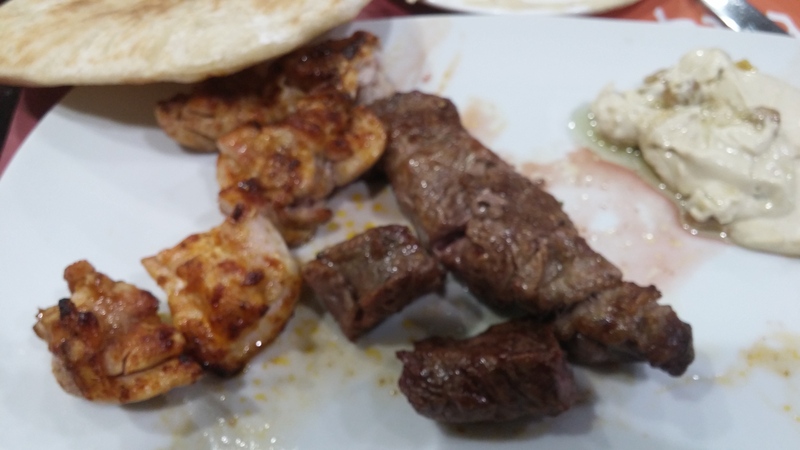 The menu is composed of a large variety of skewered meats and steaks. I ordered an entricote(rib steak) skewer with a side of rice and beans and a in house made hummus platter. After ordering our waiter barraged us with a large amount of fresh salads and fresh pita bread that were simple and delicious. The hummus was very fresh and creamy, just the way you want it to be. Then the meats came out. I asked that mine should be medium rare, and they got it done perfectly, just like everyone elses order. I also tasted other types like the sweet breads and the liver that were cooked perfectly. The sweet breads weren’t chewy and the liver was creamy. Also the pargiyot were just as good. 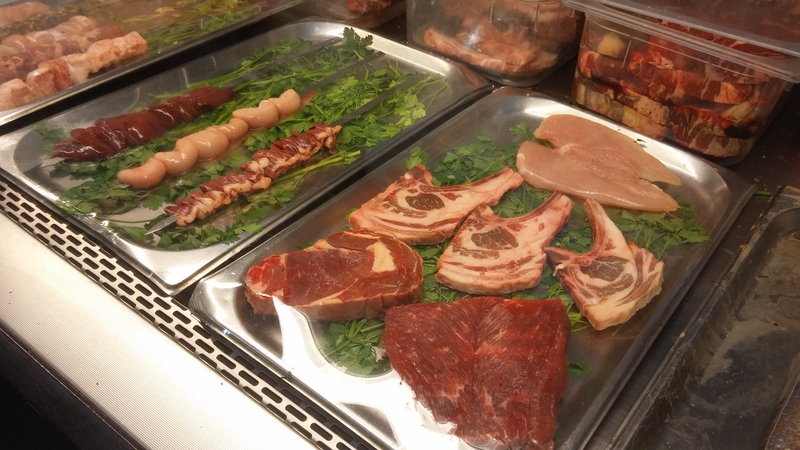 The only downside to any steakiyah is that they use the same blend of spices on every cut of meat so the flavor is the same on all of the meats. All in all it is a great place to take a family for a tasty dinner, that won’t break your wallet as well. This recipe is as simple as it comes. Serve it with a side of rice or couscous! Remove the lamb and let cool off a bit and then remove the bone, it should come right off. For gravy: Take all the juices left over in the pan and add 1 cup of red wine and 2 tsp corn starch and reduce for 10 minutes.